A pale and delicate light dry Sherry that is light in color. 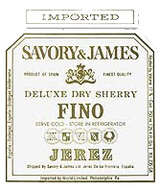 Commonly served cold as an aperitif, many consider this Spanish wine to be the world's finest Sherry. Finos are excellent when young.